A prequel to a prequel! Can you feel the synergy? 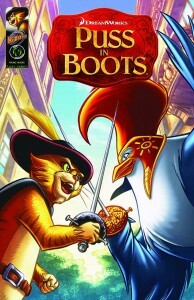 Ape Entertainment (through their Kizoic imprint) present the Puss in Boots Movie Prequel graphic novel, coming this November. Written by Troy Dye and Tom Kelesides, it features full-color art by the Kizoic crew. This is from Comics Continuum: “The exciting prequel to the Puss In Boots movie is here in this exclusive original graphic novel! Puss enters a secret sword fighting competition to determine who’s the best with a blade. Will he defeat the rabid rooster known as ‘El Pollo Mas Rapido’? Or will Chuey, the Chihuahua cat burglar, take top prize? And in a Bonus story, Puss unravels the mystery of the Maltese Gato!” Remember, the feline furry comes to theaters from Dreamworks on October 28th.